So today’s piece is not a revolutionary piece of information design, but it is fascinating. For two or so years now, we have all heard about the Robert Mueller investigation into potential contacts between the Trump campaign, early administration, and the administration of Russian president Vladimir Putin. To be clear, thus far, this has been an incredibly productive special counsel. But what happens when the whole thing is done, especially since prevailing Justice Department rules state sitting presidents cannot be indicted? Well to answer that, we have this piece from the Washington Post. Ultimately it is nothing more than a flow chart broken into pieces, separated by a textual narrative explaining the process. 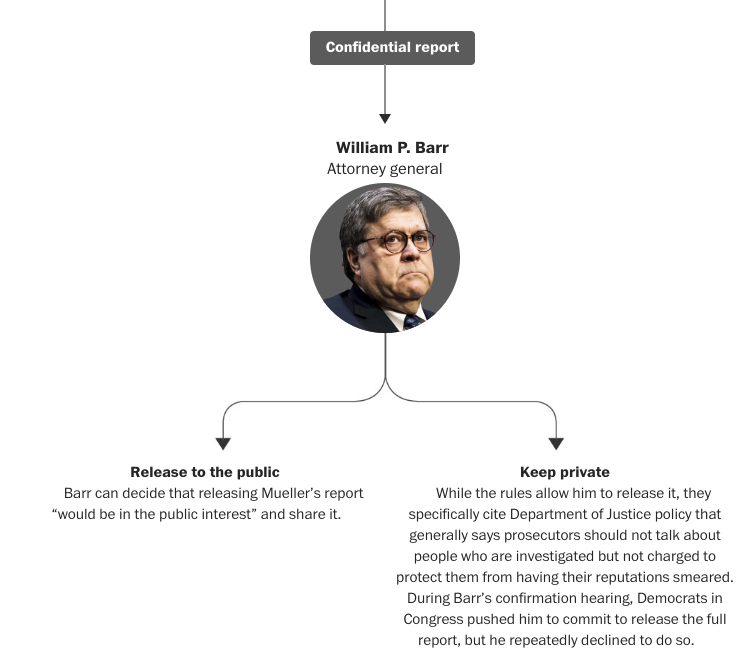 Now, I’m not certain how critical to the design each headshot is—especially Barr’s that looks especially frowny faced. However, the context in the above screenshot is crucial. The public does not necessarily have the right to the findings of the report if individuals in the report are not charged. This means that design wise, we are looking at snippets of a larger chart interspersed with text. I would be interested to see the entire thing stitched together, but the textual breaks make a lot of sense. 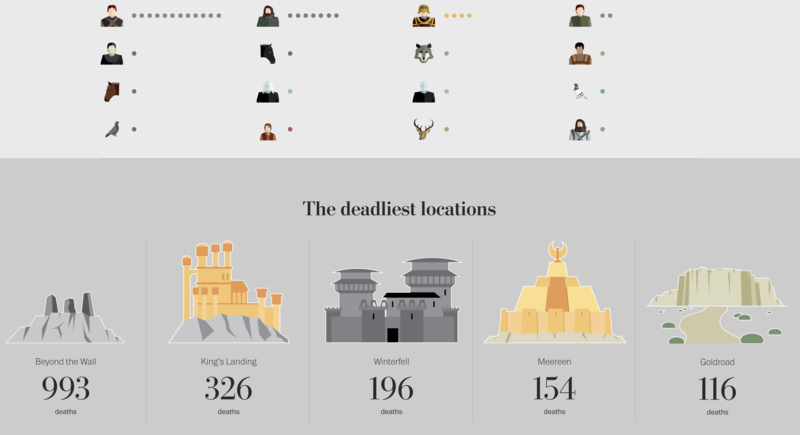 Overall, much like the sports pieces we looked at recently, this does a nice job of weaving textual story together with information design or data-driven content. Credit for the piece goes to Dan Keating and Aaron Steckelberg. 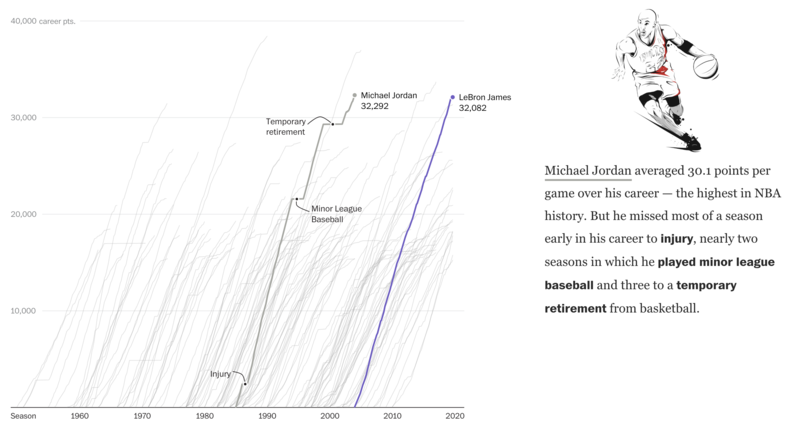 Back in 2012 the New York Times ran what is a classic data visualisation piece on Mariano Rivera. It tracked the number of saves the legendary Yankees closer had over his career and showed just how ridiculous that number was—and how quickly he had attained it. Last week, the Washington Post ran a piece that did something very similar about LeBron James, a future basketball legend, and Michael Jordan, definitely a basketball legend. The key part of the piece is the line chart tracking points scored, screenshot above. It takes the same approach as the Rivera piece, but instead tracks scored points. Unlike the Rivera piece, which was more “dashboard” like in its appearance and function, allowing users to explore a dataset, this is more narratively constructed. The user scrolls through and reads the story the authors want you to read. Thankfully, for those who might be more interested in exploring the dataset, the interactivity remains intact as the user scrolls down the article. While the main thrust of the piece is the line chart, it does offer a few other bar and line charts to put James’ career into perspective relative to the changing nature of NBA games. The line chart breaking down the composition of James’ scoring on a yearly basis is particularly fascinating. But, don’t ask me about how he fits into the history of basketball or how he truly compares to Michael Jordan. Basketball isn’t my sport. But this is a great piece overall. Credit for the piece goes to Armand Emamdjomeh and Ben Golliver. Author Brendan BarryPosted on 19 February 19 19 February 19 Categories InfographicTags bar chart, basketball, critique, data visualisation, infographic, information design, interactive design, LeBron James, line chart, Michael Jordan, sports, Washington Post1 Comment on Be Like Mike? Or at least a portion that was already funded back in March. If it was, in fact, a wall. This morning it appears as if President Trump will not scupper the funding agreement. It includes far less than the $5.7 billion he demanded, but do not forget back in March, Congress appropriated funds to construct barriers, not walls in Texas. This piece from the Washington Post looks at those plans and details how wall-like or not these border installations are. (Spoiler: semi.) The screenshot below illustrates the levee fencing would work. Whatever happened to “Tear down this wall”? But the piece also includes some really nice maps and aerial shots, also seen above, of where these border enhancements will be constructed. Overall it is just a really informative and enjoyable piece with several graphical elements. But whether this is a wall, I will leave that up to you. Credit for the piece goes to Laris Karklis and Tim Meko. Voting is not compulsory in the United States. Consequently a big part of the strategy for winning is increasing your voters’ turnout and decreasing that of your opponent. In other words, demotivate your opponent’s supporters whilst simultaneously motivating your own base. But what does that baseline turnout map look like? Well, thankfully the Washington Post created a nice article that explores who votes and who does not. And there are some clear geographic patterns. The piece uses this map as the building block for the article. 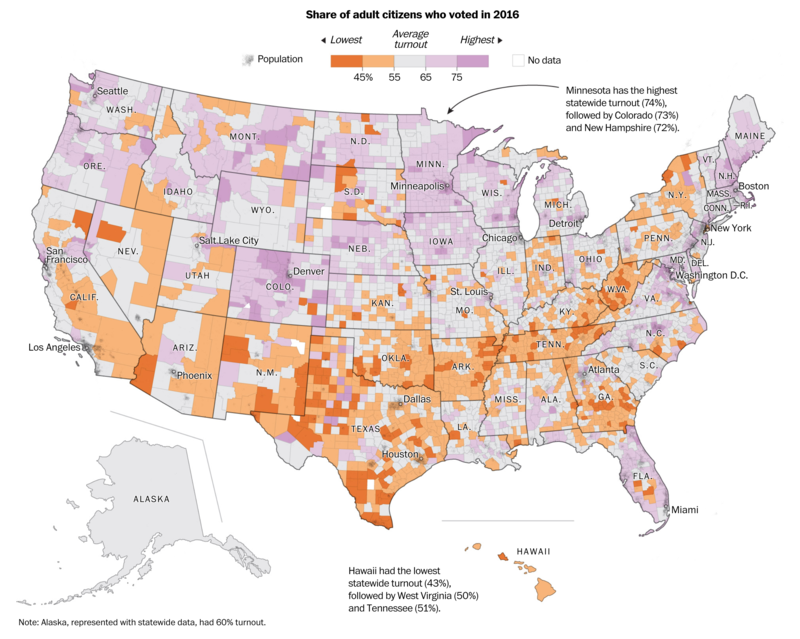 It explores the difference between the big rural counties that dominate the map vs. the small urban counties where there can be hundreds of thousands of voters, a large number of whom do not vote. It uses the actual map to compare states that differ drastically. For example, look at the border between Tennessee and North Carolina. On the Tennessee side you have counties with low turnout abutting North Carolinian counties with high turnout. And towards the end of the piece, the article reuses a stripped down version of the map. It overlays congressional districts that will likely be competitive and then has the counties within that feature low turnout highlighted. Overall the piece uses just this one map to walk the reader through the geography of voting. It’s really well done. Credit for the piece goes to Ted Mellnik, Lauren Tierney and Kevin Uhrmacher. Yesterday we looked at the importance of arms deals from the US and UK to Saudi Arabia in the wake of the brutal murder and assassination of Jamal Khashoggi, the Washington Post journalist who sometimes wrote critically of the Mohamed bin Salman (MBS) regime. But what about the actual murder itself? What do we know? Well at some point today, President Erdogan of Turkey will give a speech, just prior to the opening of the big Saudi conference the Saudis have branded the Davos of the Desert. In Erdogan’s speech, he is expected to reveal even more of the details of the murder as collected by Turkish intelligence services. But as this story has been unfolding, the Washington Post has been collecting the details about the alleged 15-person assassination squad. The entire piece is worth reading. It provides great detail and walks the reader through how the story was pieced together. And relevant to my blog it makes use of some nice data visualisation and design elements, including this graphic. It captures some of the arrivals and departures of six of the men identified. The graphic also notes that sometimes people will not be documented because they arrive on diplomatic flights instead of commercial flights. As for the rest, the Post used photographic evidence to show how one of the individuals was likely a bodyguard or in the security services for MBS. Phone records and the photographic records of Turkish border control were also used. Taken together, it paints a damning portrait of the supposedly modernising MBS regime. Of course now we can only wait to see what Erdogan has to say this morning. Credit for the piece goes to Aaron C. Davis, Aaron Williams and Jason Bernert. If you have been living under a rock, Saudi Arabia barbarically murdered/assassinated a Washington Post journalist in the Saudi consulate in Istanbul, Turkey about three weeks ago. The journalist, Jamal Khashoggi, was a Saudi citizen and US resident living around Washington from where he reported on the new Saudi government under Mohammed bin Salman (MBS). 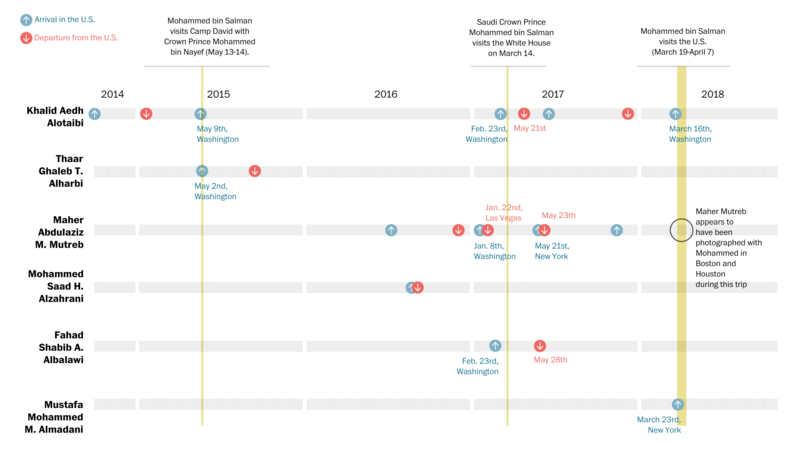 There is a lot to unpack in the story, but the key points are that Saudi Arabia has, for weeks, disputed the idea that his fingers were severed, then beheaded, body dismembered, and corpse disposed of within their consulate in Istanbul. Only yesterday did they begrudgingly admit that it was a “rogue” operation that involved some of the closest advisors/bodyguards to MBS. (We will look at that later.) How do we know all this? Basically, every time Saudi Arabia denies something, the Turks let leak evidence proving them wrong. So while the story will continue to develop, what is the potential cost for Saudi Arabia? Well, according to President Trump, not arms sales. Although this morning Germany announced it was temporarily halting all exports to the Saudi kingdom. 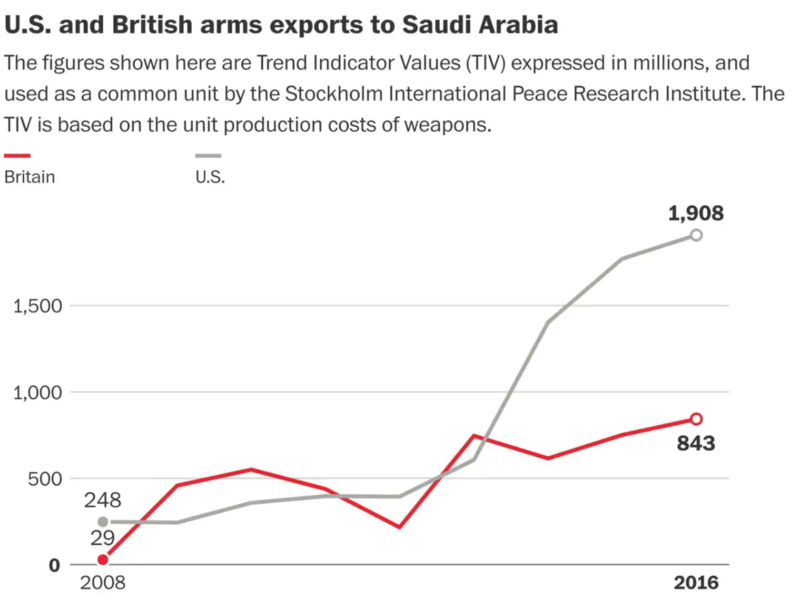 But the two of the largest providers of weapons to Saudi Arabia are the United States and the United Kingdom. And that is how we get to today’s chart. The question is what, if any, action will these two countries take against Saudi Arabia? Will these line trend down anytime soon? It’s a line chart from the Washington Post. There really isn’t much to say in its design. However, what I found interesting is the unit of measure. We might expect dollars, pounds, or euros, but instead we get TIV, or trend indicator values. It’s a unit devised by the data provider to allow a common measurement, presumably so that we can do just this: compare two different countries’ arms sales. 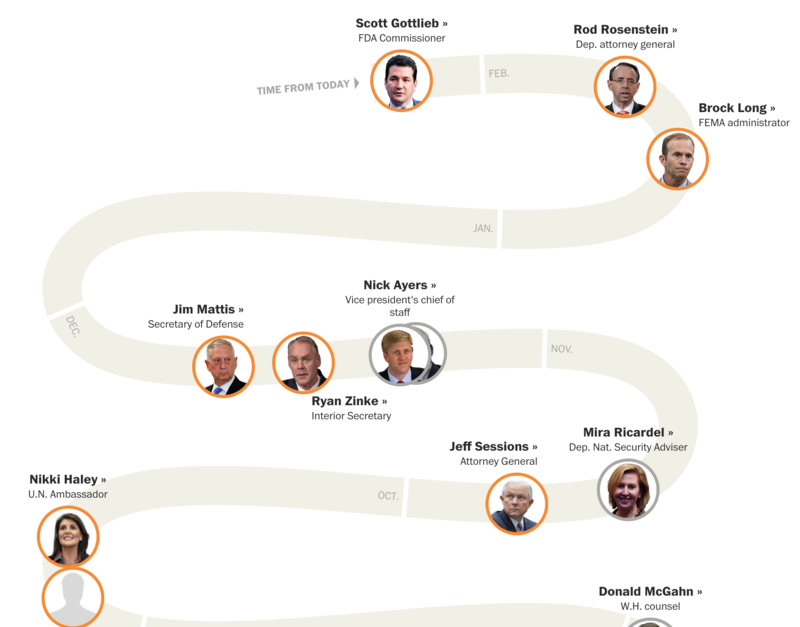 Credit for the piece goes to the Washington Post graphics department. Even the Washington Post admits there sort of is no such thing, because standards vary across the world. But broadly speaking, you have enough for the essentials and then a little extra to spend discretionarily. The concept really allows us to instead benchmark global progress in development. 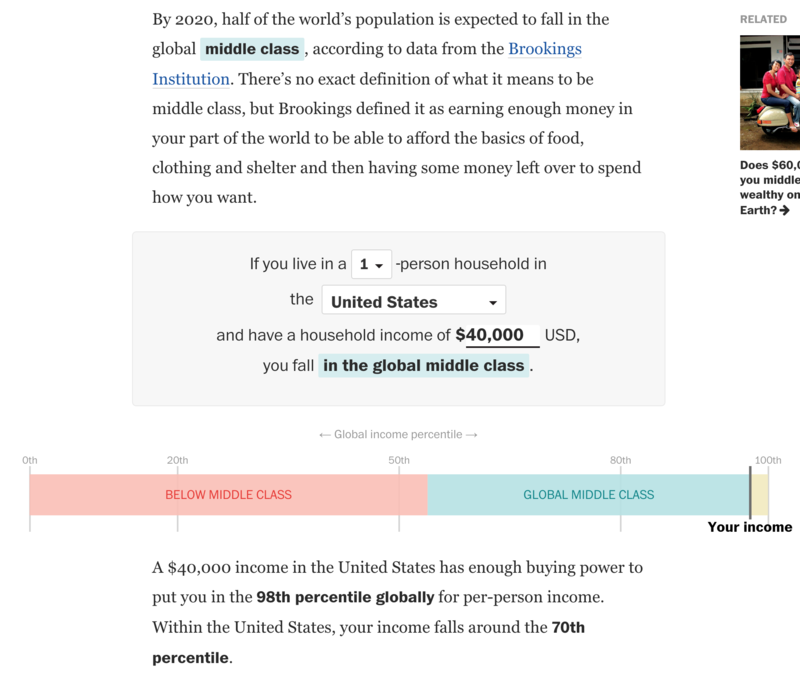 Regardless, yesterday the Post published a calculator that allows you to compare household income across the world to that global middle class. The catch, however, is that income is priced in US dollars, which is the currency of very few countries. 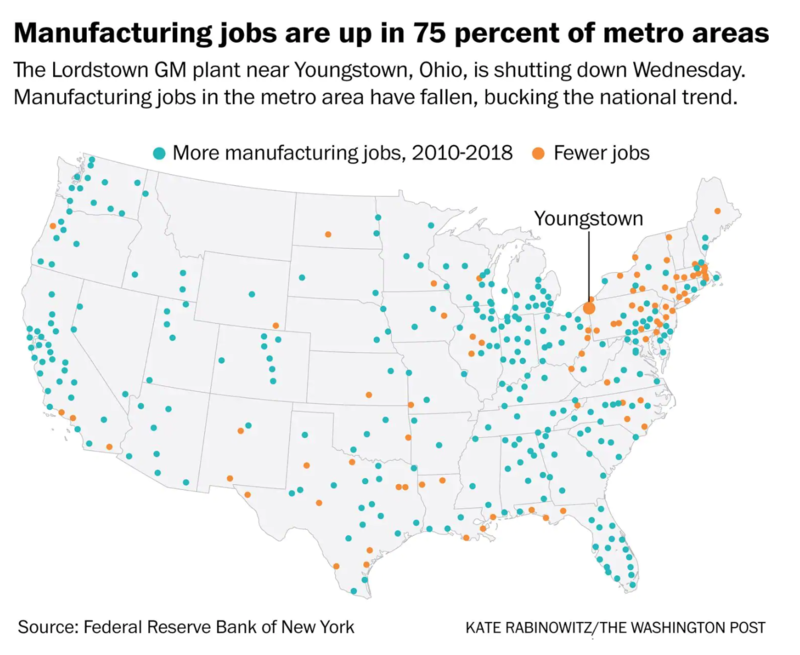 But thankfully, the Post gives the methodology behind the calculator at the end of the piece so you can understand that and the other little quirks, like rural vs. urban China. From a design standpoint, there is not much to quibble with. I probably would not have opted for red vs. green to showcase global middle and global lower-than-middle class. But the concept certainly works. Credit for the piece goes to Leslie Shapiro and Heather Long.